This is a very simple circuit that can be used to sense electromagnetic radiations. The circuit can even detect hidden wrings. A 1mH inductor is used for sensing the electric field. 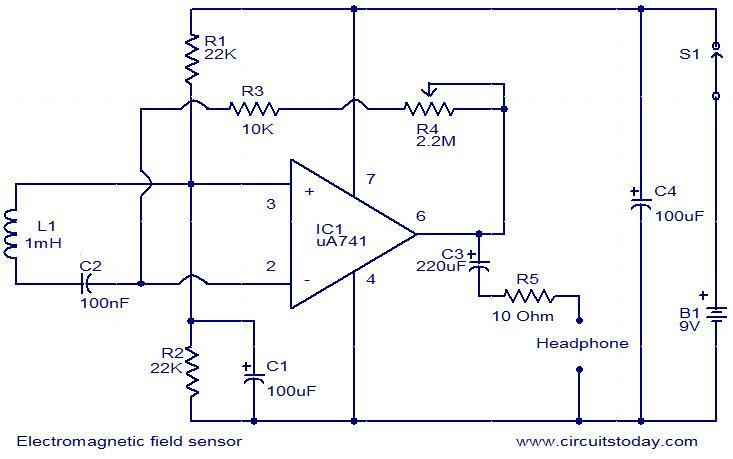 The electric field will induce a small voltage in the sensor inductor and this induced voltage is amplified by the opamp.The headphone connect at the output of the opamp will give an audio indication of the electric field. For example, the electric field around a mains transformer can be heard as a 50 Hz hum. The POT R4 can be used to adjust the gain of the amplifier. By keeping the sensor inductor near to a telephone line, you can even hear the telephone conversations. It is better to have a radial type inductor for L1. The POT R4 can be used to adjust the gain. The switch S1 can be a slide type ON/OFF switch. All electrolytic capacitors must be rated at least 15V. Sir ,what type of capacitor is use in this circuit? Can find weak electric field? can u tell us the calculation steps and details about the complete circuit? especially calculation regarding inductor value.also can i know how to implement and execute it on multisim or any other software and get the output? can i use 2 680uh inductor in series instead of 1mh. Can it sence radiation from mobile phones (900,1800,1900 MHz) ? And what is the range of frequencies it can capture? what is the voltage rating of the polarized capacitors?Thika Kenya. Is C2 an electrolytic or ceramic capacitor? Hi.. I am trying to make a pick and place robot using ELECTROMAGNETISM…if you can then please provide me a tutorial to proceed. I need to vary the weight on it. sir, in place of inductor i can use magnetic coils. Hi Gupta you can try 2 to 3 hundred turns of 32 swg super enamelled copper wire on a 20mm dia plastic bobin, which is normally used for picking up telephone stray magnetic field to amplify the telephonic coversation for a group of people to listen in those days. Hi, is there a way to also include an LED which would indicate the presence of the EM field ? Hi Aatsh you can use 2 in series nothing wrong. Hi Aatish you can use one 1M pot itsely that itself will give sufficient volume. For inductor you have to use only radial type whch can pick up the stray magnetic field. other types may not pick up the field sufficiently to give the indication. Where can I find a 2.2 m pot at R4? 1) how i test to ckt? 2)can i replace led for hp? 3)can u show me which terminals of pot i can short? Hi Naik the inductor picks up the stray magnetic field available in its near visinity and amplifies it through IC 741, which is a variable gain amplifier and feeds it to the head phone for listening. will be useful for finding the route of consealed power wiring at home by listening to 50 / 60Hz power supply frequency. i want to know how this ckt actually works? I want ask can I test leak from microwave oven. Thx a lot it worked really well,Can i use led in place of speaker? i want to ask that radial inductor is not available in my region then there is any other alternative for that…….can you please tell me…..
can you explain the circuit. and what kind of opamp in there? is it e differentiator? what should i changes if i want to increase the detection frequency until 6Mhz?